For Grades K-8 during the school year we offer Co-op classes for Art, Science and Creative Writing. We also provide a semi-typical schoolroom setting for classes such as Math, Reading, Spelling, History, Language Arts. Classes are split into K-3rd and 4th- 8th Grades. 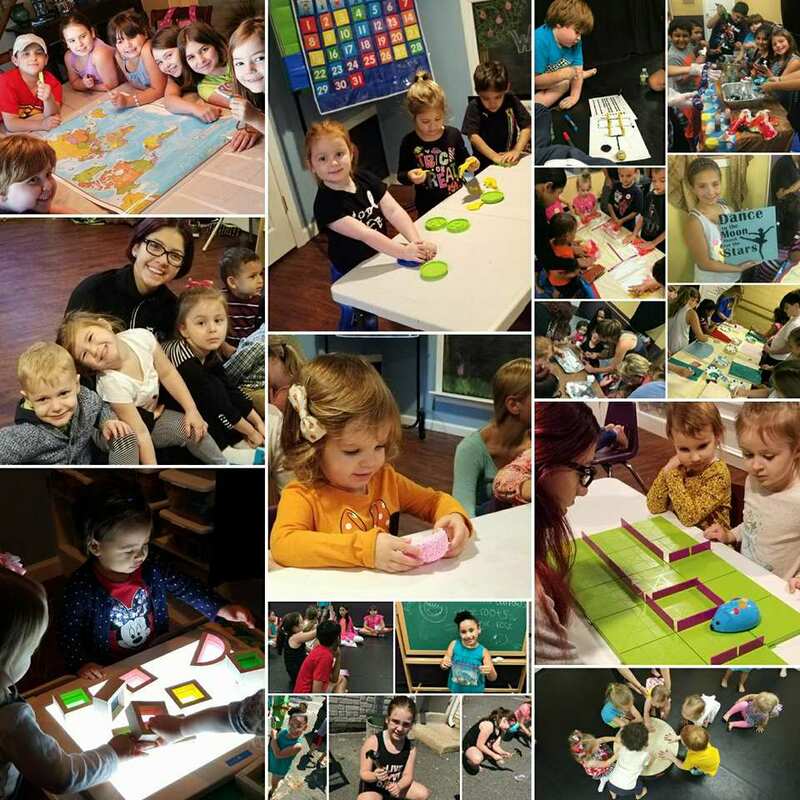 We offer many Mommy and Me Classes... Music, Art, Science, Fuzzy Wuzzals (all about animals), Baby Bop Dance, Baby Signs with My Classy Baby, Kindergarten Readiness, Spanish, Obstacle Course Fun and Phonics. Our School Year runs from September to the First Week of June. We have: a Mommy and Me Tot School Beginnings (pre nursery) for ages 1 ish - 2 years. Mommy and Me Tot School/ Slow Separation (Ages 2 &3) Nursery Program. We also offer Preschool and K4 (Drop off ages 3,4 &5). During the School Breaks we hold Camps- our most popular Camp is Messy Summer Fun offered for 9 weeks over the summer. During the Summer we also have Reading, Writing, Science Enrichment, Sewing and STEM camps. Additionally, there are Winter Break and Spring Break Camps... Columbus Day, Christmas Break and Martin Luther King Day we do the workshops Fall Festive Fun, Winter Wacky Chaos I and Winter Wacky Chaos II. We also offer Sewing, STEM and Paint Workshops through out the year. Camps and Workshops are ages 1-13 (Ages 1-3 are Mommy and Me) (Ages 3+ are drop off). We have so many activities outside the typical classroom setting... that both students and their families can enjoy together. Community Garden- We have a community Garden located at the Cornell Cooperative Extension Farm in East Meadow. It is a fun experience to watch our plot of land go from "just dirt" to a bountiful garden. It teaches that through hard work and perseverance growth is obtained. Field Trips- We offer field trips to enhance our classroom learning... we have visited the Statue of Liberty, The Natural History Museum, NY Hall of Science, Aquariums, Queens and Bronx Zoos, Long Island Children's Museum, Air and Space Museum, Celebrations in the Kitchen, Farms, The National Geographic Ocean Encounter....to just name a few. Swim Parties and Discounted Movies- Periodically we hold Swim parties and about a Movie a month at a local movie theatre... to provide affordable family fun and student bonding.